Artist’s concept of the explosive collision of two neutron stars. Illustration by Robin Dienel. Astronomers worldwide were alerted to the event by the Laser Interferometer Gravitational Wave Observatory (LIGO), which detected ripples in space-time known as gravitational waves created by the massive explosion. The discovery by Carnegie astronomers was the first gravitational wave event with an optical counterpart, and it came two years after the 2015 detection of the first gravitational wave by LIGO. In our latest Q&A, DTM cosmochemist Larry Nittler shares with us his excitement about the explosive stellar event. Why is the optical discovery of the merger exciting? What is exciting is not so much the optical discovery per se, but rather the combined discovery across the electromagnetic spectrum and gravity waves. This is exciting for many reasons: Observing the same event with both gravity waves and light allows much more information to be obtained than with a single method and really means that the field of gravitational wave astronomy has come into its own. What exactly did we learn from the discovery? The most exciting thing to me was the confirmation that "r-process" elements (about half the periodic table above nickel) are made by colliding neutron stars. I was so excited the day of the discovery I put out a tweetstorm to try to explain why. Most elements are made in stars and a lot of the basics of how that happens was figured out in the 1930s-50s. For example, helium is made in the Sun when four protons fuse, and it requires high temperatures so the protons can get close to each other. This 'fusion' process releases energy and occurs normally during stellar evolution. Fusion in stars can make most elements up to iron. However, people quickly realized normal fusion won't work to make elements heavier than nickel, as these require energy instead of releasing it. So, a new explanation was needed to understand where heavier elements come from. In the 1950s, people much smarter than me found you can explain relative abundances of most heavy elements if they formed by neutron capture. If enough neutrons are floating around, a nucleus could capture them, become an unstable isotope, and then decay to a heavier element. People found solar system abundances could be explained if there were 2 n-capture processes, a slow one and a rapid one (s and r-process). Some heavy elements (like barium) are made by s-process, some (like gold) by r-process, and some by a mixture of both (like mercury). However, this was purely phenomenological—at the time, nobody knew if these processes really existed or where they may happen. It was soon figured out that the s-process was associated with low-mass stars like the Sun at the end of their lives once they become red giants. The reality of the r-process was proven in the late 90s by observations of really old stars found to have pure r-process abundance patterns. But where r-process elements are made has remained elusive and controversial for decades. Supernovae (explosions of massive stars) were popular for a long time because they make a lot of neutrons. But as supernova computer simulations became more sophisticated, it became hard to actually get them to make r-process elements. A few years ago, colliding neutron stars became a popular idea. Neutron stars are insanely dense objects made purely of neutrons. They are what's left over after a massive star explodes as a supernova (unless it becomes a black hole). Computer simulations found that two neutron stars crashing give conditions just right to explain r-process elemental abundances. The announcement of the optical discovery of the neutron star merger proved this to be the case: The neutron star merger was detected by gravitational waves followed up by gamma-ray, x-ray, radio, optical, and infrared observations. Analysis of how light faded at multiple wavelengths showed quite clearly that synthesis of r-process elements must have occurred in the merger! So around six decades after the r-process was invented based on mathematical analysis of elemental abundances, we know it is real and where it happens! 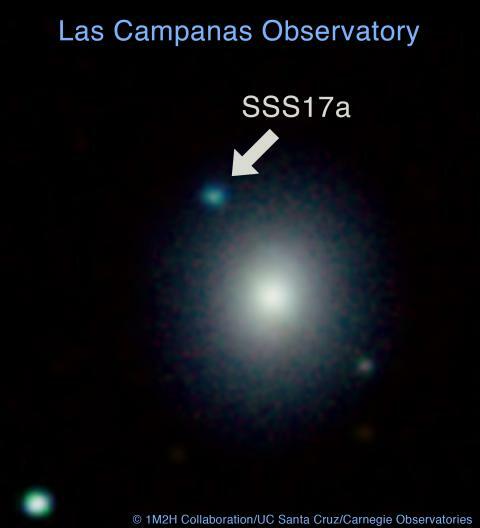 Named Swope Supernova Survey 2017a (or SSS17a), the discovery is published in a quartet of Science papers. GOLD! Seriously, it's really cool that this one event made something like 200 Earth masses of gold, and even more platinum. What might the discovery mean for Carnegie's Department of Terrestrial Magnetism? This discovery may have important implications not just for DTM Astronomy and Astrophysics but also for DTM Cosmochemistry. A lot of our work examines isotopic variations in meteorites to tease out the sources of material in the protoplanetary disk that became the planets and understanding how it was distributed in the disk. Knowing that r-process elements are made in colliding neutron stars will help us better interpret the r-process isotope variations we see in terms of the history of the Galaxy near where the Sun formed.